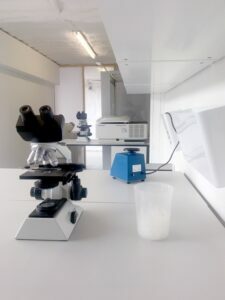 Open Cell is a new collaborative space for biodesign and science in Shepherd’s Bush London. 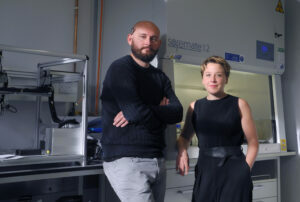 We support the London ecosystem of designers and scientists incorporating biological techniques into material development. 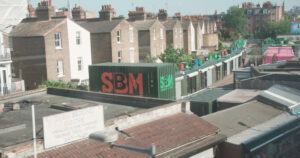 The space is composed of modular mixed use areas including labs, studios and workshops across 45 shipping containers adjacent to Shepherd’s Bush Market. Become a resident or get involved! My co-founder Helene and I ran a biodesign exhibition with the Royal College of Art in White City, a year ago. The ideas that emerged were incredible but there was no space for them to develop. 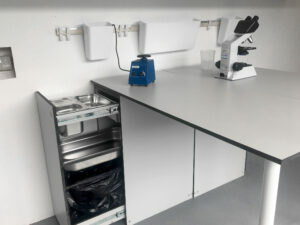 Not only did teams need space but also access to lab equipment. We had exactly the same problem since we run a startup specialising in DNA prototyping tools called Cell-Free Technology. 45 shipping containers from above.. Exciting and terrifying! We spent a year searching for spaces, writing proposals, receiving rejections and having negotiations. It was demoralising at times but in the end we convinced U+i group, a property developer specialising in regeneration, SynbiCITE the UK’s synthetic biology industry and engineering biology industrial accelerator, and the London Borough of Hammersmith and Fulham Council to support the initiative. After pulling the idea into reality in early April we felt elated but terrified..
We were excited to get the space established but since we were just a team of two we saw the mountain of work ahead. A friend, Dominic Falco, introduced us to Biotop, an Austrian science collective and architecture studio. 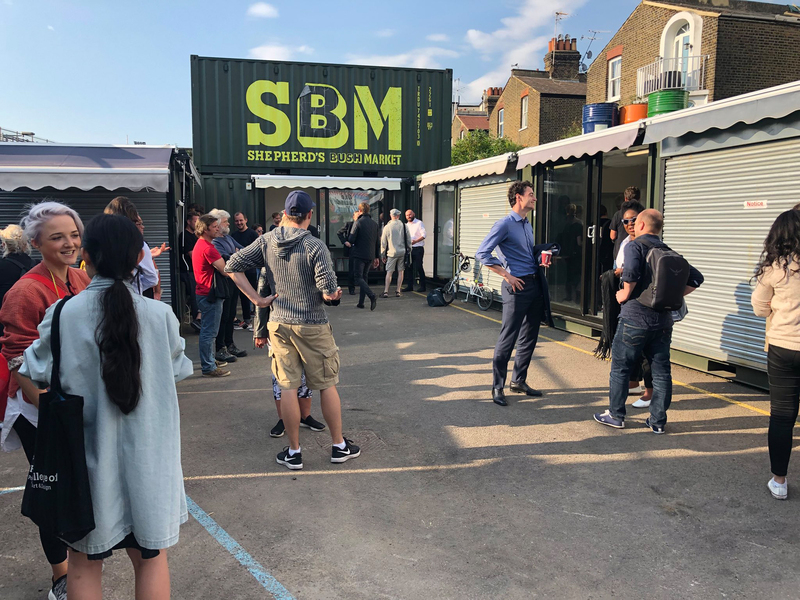 We only began talking only in April but within a month the entire Biotop team flew to London to begin building labs in shipping containers! We installed fume cupboard, BSL cabinet, CO2 incubator, sink, autoclave, thermocycler, microscopes, centrifuges, -80 freezer and Biotop created a modular high pressure laminate (HPL) bench. Biotop’s team of Anna Ritscher, Lukas Hutter, Anna Koeferle and Ralf Bliem hard at work cutting high pressure laminate (HPL). 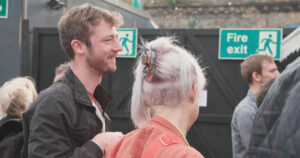 Louis Alderson-Bythell (founder Olombria) and Alice Potts are RCA fashion grads and Biodesign Challenge alumni. In a way it makes perfect sense since the startups and designers who will base themselves in Open Cell are working in a very unusual discipline. They are bridging the fields of technology, biology and design. One example is designer Alice Potts who has been working with food waste to find way to upcycle it into fashion. This type of approach is central to the style of businesses that Open Cell hopes to support; ecologically sustainable manufacturing methods and circular product life-cycles along with data-driven research are essential ingredients in designing new materials. We held an early viewing at the end of May but now the doors are open to the public and all are welcome to participate. We want the next phase to include a community material research lab and biomakespace. We are reaching out to anyone interested in taking residence or getting involved! 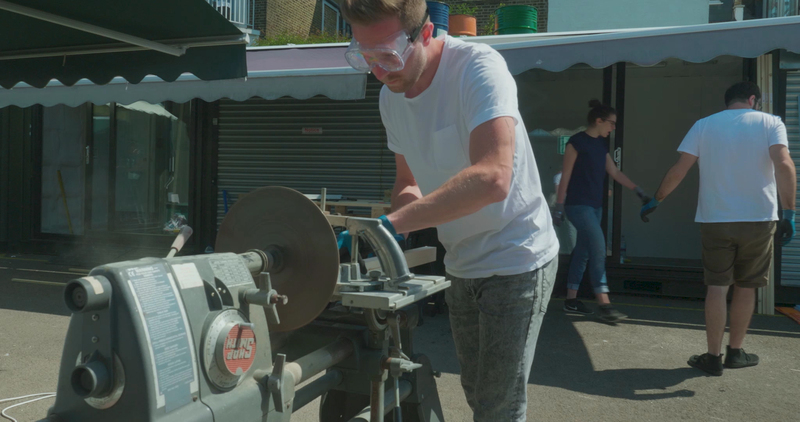 The team will host a venue for the upcoming London design Festival (September) and will also play host to homegrown events like the London Biotech Week that will be held later in the year. Part of the mission is to increase understanding of the impact of biotechnology and invite debate and discussion around its use. We are open and all are welcome. Thomas Meany is the co-founder and CEO of Cell-Free Technology, a biotechnology company that enables high speed DNA circuit prototyping. Prior to this he held an interdisciplinary fellowship in the University of Cambridge Plant Science Department studying applications of technology in synthetic biology. He holds a PhD in physics and prior to working in biotechnology he developed semiconductor circuits in the quantum information group at Toshiba’s Cambridge Research Labs. How can we bring AI and technology of nature? Most of the technologies are designed to isolate human How can we adapt ourselves to live with other species? Will we create an economic system that can include nature and other species? My personal aim is renovating a design career and improve my knowledge on these questions. However, discovering the answers by an individual is very arduous, so I request your help to develope new ideas for future of all species in this beautiful planet.